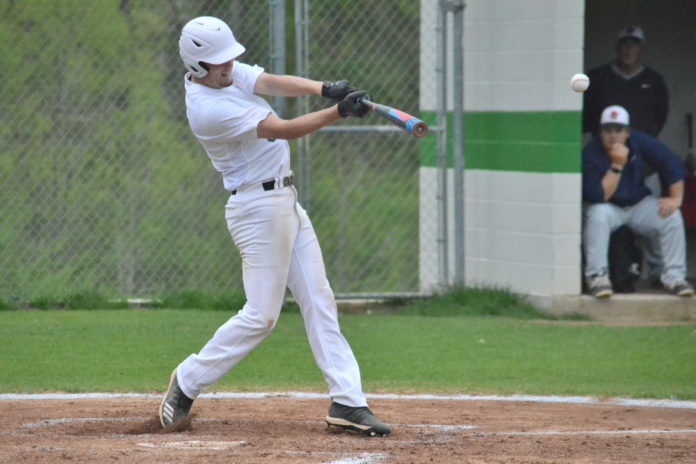 HOLLY POND, Ala. – New Hope traveled to Holly Pond to take on the Broncos in their final home game of the season and the visitors ended up taking the game 8-2. After the game, four Holly Pond seniors were recognized in a senior night ceremony, Caleb Lambert, Jacob Ring, Alex Corngelio and Zac Glasgow. The Indians struck first with an RBI single in the first inning, but the Broncos tied the game at 1 with an RBI double from Jacob Ring in their half of the inning. It was zeros for the next two innings, but New Hope broke the tie when they drew a bases-loaded walk in the fourth inning. The Indians stretched their lead to 4-1 in the top of the sixth inning on an RBI double and a sacrifice fly and they added four more in the seventh on an RBI double, a pair of Bronco errors and a bases-loaded walk to pull away. Andrew Light made it 8-2 on an RBI fielder’s choice, but the Broncos didn’t get any closer as they wound up dropping the game 8-2. Kyler Chaney pitched three and 2/3 innings and struck out two for Holly Pond while collecting four hits at the plate. Ring added three hits and an RBI. The Broncos will travel to St. Bernard on Monday. The Lady Bearcats blanked Decatur on the road 3-0 Friday night to wrap up this year’s sectional title and secure a home playoff matchup against Albertville in round one. Abby Branham scored twice in the win, Ashlei Bryant scored a goal of her own and Pia Muri and Mimi Lunsford each collected an assist. Cullman head coach Jacob Brown wanted to set the tone early and he was proud of the way his team performed. The Bulldogs blasted Fultondale in five innings on the road Friday and racked up 15 hits in a 19-1 rout. Kainen Cruce tossed all five innings for Hanceville in the win, allowing just one run on four hits and collecting four strikeouts. Adam Cooper led the way for the Bulldogs at the plate going 3-for-5 with four RBIs. Isaac Holmes (one hit) and Ashton James (two hits) each plated three runs and Tate Brown (two hits) drove in a pair of runs in the win. The Lady Bearcats took a 3-0 lead in the top of the first and Sydney Holder kept Gordo’s bats quiet enough for Cullman to pull away and win it 9-1. Alex Stansell was 3-for-3 at the plate with two RBIs in the win and Savannah Davis (two hits) led the Lady Bearcats with three RBIs. Ashlen Heatherly (two hits) drove in a pair of runs for Cullman. Cullman jumped out to a 3-2 lead in the top of the second, but Brookwood plated five in the bottom half of the inning to move ahead 7-3. McKenna Kline was 2-for-3 at the plate in the loss and Haley Shannon (one hit) and Alex Stansell (one hit) each collected an RBI.